The publication of this issue is self-financed and produced with the support of the exhibition project «re: ex-post. Critical Knowledge and the Post-Yugoslavian Condition», January 20th until February 14th, 2010, Open Space, Vienna, Austria. The political image of Serbia, through the windows of the LGBTIQ community can today be presented in several ways. By political engagement of certain activists of the LGBTIQ community, we imperceptibly lost the significance of a “movement” that has been building and destroying itself for the second decade now. The adoption of Anti-Discrimination Law, the organizing of the Pride Parade and better media visibility of the community are the three most important activities in 2009. Through the window of a radical feminist and lesbian activist, the stated three themes represent an intermezzo in the total activism, the meaning of which is reflected in the creation of “safety” in every life situation. Therefore, if we are discriminated on the street, in our families, at work, at school or university, at the doctor’s or yet in a song, we actually need much more than a law, we need a Pride Parade on the way to our favorite café as well and we first need to understand and accept the picture and tone of our reality. We are currently in the “mute” phase of waiting for the successes and failures to be confused, the successes and failures of the responsibilities of the state, political leaders and individuals that, while building their own heroism, fell asleep over big and important responsibilities. For me it is better this way because it leaves room for everyone to understand their own version in their head. The Roma have a long history of migrations that repeatedly brought repression to their people over the centuries. European countries began introducing laws against migrating peoples (i.e. nomads, travelers) in the mid-Fifteenth century (1). Migrants were perceived as an unsettling factor, even as a threatening and invading group, one that jeopardized the safety of the majority population. Without a registered identity, many Roma remain completely isolated as citizens in the societies on whose territories they live. Being constantly relocated and repopulated, many have been migrants over the centuries; even within the boundaries of the countries whose citizenship they hold. Apart from accusations, disappointments and misunderstandings in their relations with the majority population, we are still facing deep discrimination of Roma, which doesn’t have its roots only in ethnic and cultural racism or anti-Roma sentiment. Poverty and nomadism are threatening factors for all of those who live in social systems based on the system of ownership, accumulation of goods and territorialism. Western policies have tried for centuries to include the poor in the system of social protection, or to get rid of them: to banish or eliminate them. Roma are, for the most part, an ethnic class characterized by extreme poverty that can present an obstacle to national or European integrations. It appears that the relation between Roma and non-Roma is, first and foremost, defined by the borderline between wealth and extreme poverty. Dušan Grlja, Prelom kolektiv /// Why Do Partisans Still Matter to Politics? What could be the political sense of referencing to Yugoslav partisans today? The outlines of contemporary post-Yugoslav political configuration can provide one simple answer. From the perspective of peripheral neo-liberalism, the advent of capitalism in former Yugoslavia (through the destruction of the socialist federal state and through both civil and “humanitarian” wars), seems precisely like the transition from the heteronomy imposed by the socialist system – being completely dependent on the decisions and whims of State and Party – to the autonomy enjoyed by “finally” aligning to the “free world”. This kind of autonomy is perceived in this region as the final achievement of a “thousand year dream” of national – in fact, ethno-nationalist – self-determination of the newly-formed states, thus retroactively making former common state a “prison-house of nations”. Therefore, it serves the purpose of rendering socialist Yugoslavia, the communist movement and Marxism into something that has been definitively surpassed, belonging to the past’s long gone times of repression, reaffirming thus the dominant anti-communist “consensus” as the main ideological support of contemporary neo-liberalism. It is precisely this zealous anti-communism that unifies the apparently opposed political options of “democratic” pro-Europeanism and “patriotic” nationalism, religious chauvinism and the struggle for human rights, a re-traditionalized culture of “our fore-fathers” and a democratic culture of civil society, the identity politics of nation-state building and multi- or inter-culturalism. The figure of partisans, then, represents the stand that discloses and radically opposes this anti-communist consensus. In his essay Serbia versus Serbia, the Sarajevo-based theoretician Nebojša Jovanović posits a thesis that – similar to the constellation of the film Strangler Versus Strangler (where beyond a monster-strangler, an asocial and retarded outsider who kills out of his inability to comprehend social relations or accept the principles of exchange that constitute a social environment and an individual as a part of it, there exists an “insider” killer, a person who comprehends those relations and principles “beyond any doubt” and thus participates in the social and economic life) – the policy of the so-called second or “Other” Serbia was equally productive towards internal logic and economy of warfare – all the while sticking to the “safe investment” of pointing fingers towards its foul manifestations and consequences. Without further developing this thesis (it can be read in the essay, published in the Prelom magazine, no. 2/3) and with maintaining respect for the substantial achievements of the local anti-war movement which has developed and has been directed almost exclusively from the position of Other Serbia, we cannot continue to indefinitely hide the fact that those sworn enemies of the “Serbian cause” have always had one mutual, but also mutually repressed defining feature: they were against public property and worker self-management and for capitalism and privatization. The historian Eric Hobsbawm developed a thesis that even small, left-oriented and progressive movements have a tendency towards establishing their tradition. 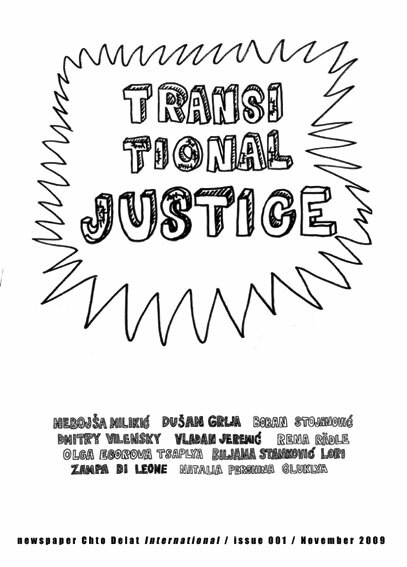 In this text, I will draw a parallel between the Stonewall riots that are perceived as the beginning of the contemporary struggle for the rights of sexual minorities and the Pride Parade that was planned in Belgrade 40 years later. Very concisely, I will state the circumstances in which both events take place, the dominant perceptions of human rights, and try to put the common experience in the repression into a framework of the beginning of any social liberation.